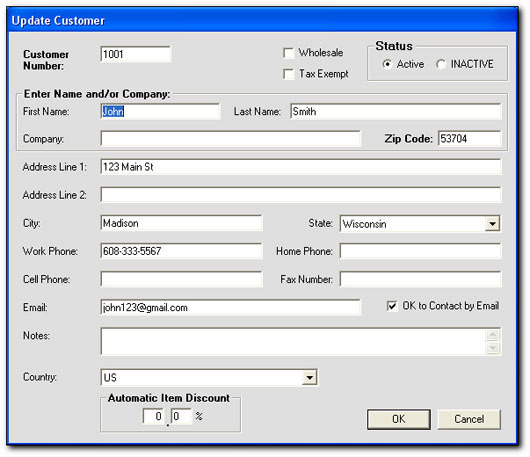 On this screen, you can look-up existing customers or add new ones. When you select an existing customer from the list, their order history is shown on the right. To quickly locate a customer, begin keying their last name (or company name) in the Last Name text box. Add new customers or update info for existing customers. Once a customer is added or located, you can add an order. When you add an order line, you select a product, source (how the customer heard about your product), quantity and price. You can set a default tax and shipping rate in Options Menu. Shipping and tax are optional. When you've completed entering orders, EZ prints receipts or invoices for you. You can add your company logo in the Options Menu. You can also add a custom note to a receipt. 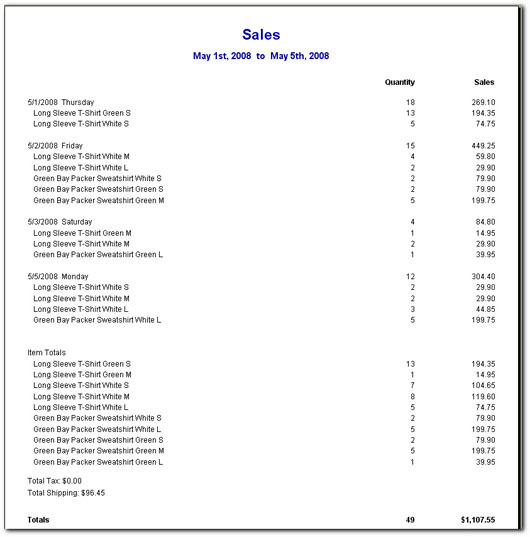 This is an example of just one of the many sales reports available to you. This report shows product count and revenue by date for a selected date range. See the Report Criteria screen below for reporting options. 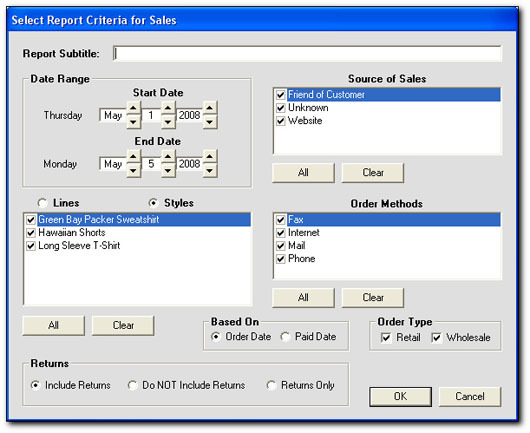 On the report criteria screen you select the Date Range, Products, Source Codes, Order Methods and Order Types for computing the Sales Report above. This is a very powerful sales analysis tool. There are many different ways to select customer labels for printing. You can also create return address labels for your business, print your company's return address on envelopes, create 1-time labels, duplicate labels and change the name and address on labels. 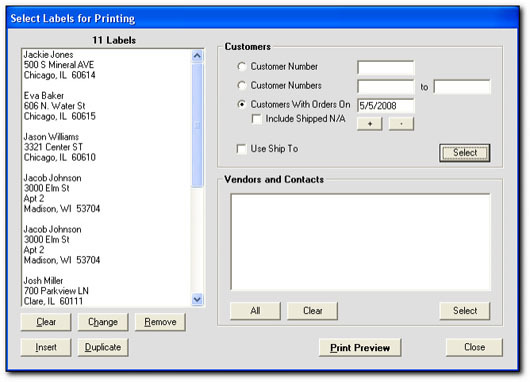 After you select your labels, you click Print Preview and then print the labels. 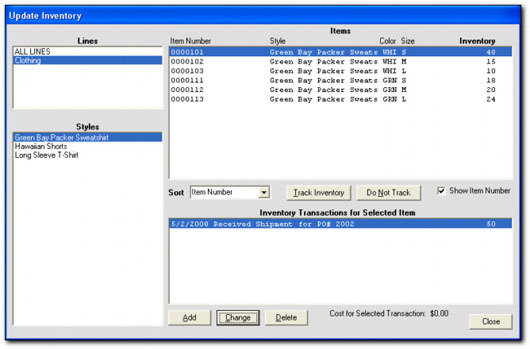 To track inventory for an Item, select the Item and click Track Inventory. The inventory is displayed next to the Item and all transactions are listed below. The Item inventory is updated when a transaction is added, changed or deleted. 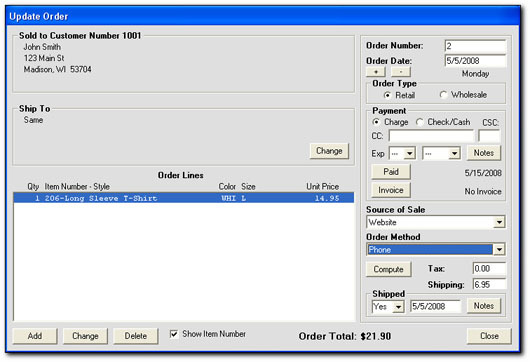 When an order is added, inventory levels are automatically adjusted. The Inventory Report shows the inventory levels for all the items you are tracking. Tracking inventory for an Item is optional. 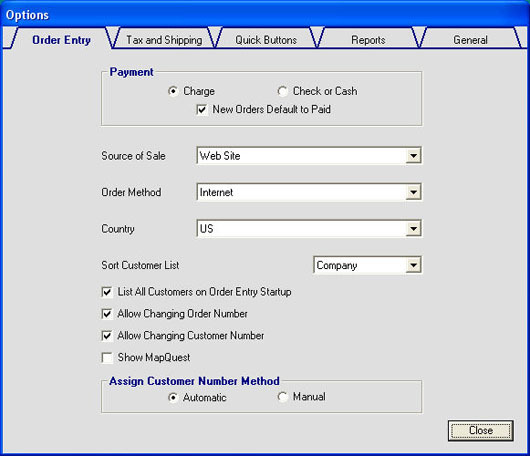 In Program Options you can set the default Payment Type, Order Method, Tax Rate, Shipping and Country. 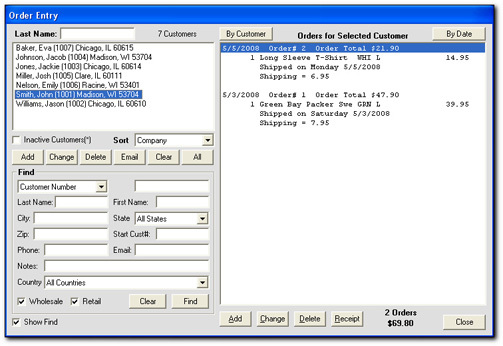 Any number of Order Methods can be added to your database. 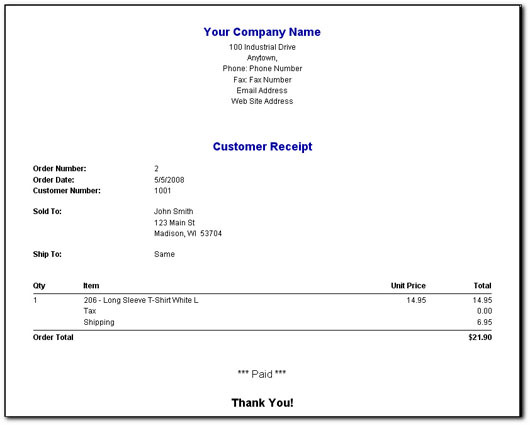 You can also optionally add text messages to print on your receipts. For example, Invoice Terms are Net 30 days. Information for the selected vendor or contact is listed below. You can Add, Change and Delete vendors and contacts. Click Email to send an email to the selected vendor or contact. 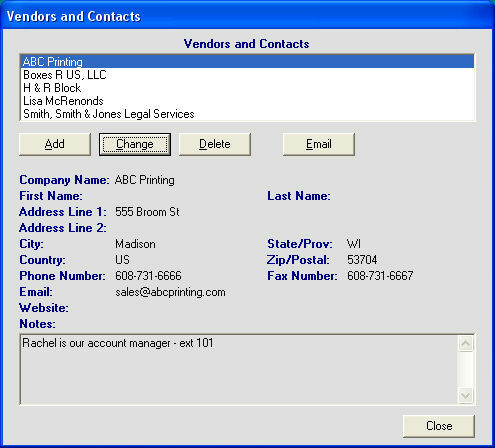 A Vendor could be a company you buy supplies from and a Contact could be a person you frequently contact for business purposes.